We celebrated a special birthday party at our place last night with a delicious super healthy meal. Last year at a friend’s BBQ we tasted the most incredible turkey burgers. They gave us the recipe and because of the ingredients I was missing I adapted it slightly from the original last night. 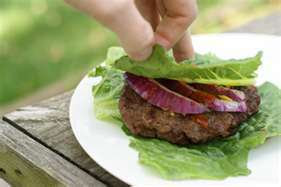 The original recipe came from http://allrecipes.com/Recipe/Cumin-Turkey-Burgers/ We used lettuce wraps instead of regular buns and a slice of tomato in the turkey burger. The burgers themselves were quite tasty and didn’t really require any condiments. Mix the eggs, jalapeno pepper, and garlic in a large mixing bowl until the eggs are well blended. Add the soy sauce, Worcestershire sauce, cumin, mustard, paprika, chili powder, salt, gluten-free croutons, and turkey; mix well and form into 12 patties. (We mixed all the ingredients into our food processor together at once, it worked well). Cook the turkey burgers on the preheated grill until no longer pink in the center and the juices run clear, about 4 minutes per side. An instant-read thermometer inserted into the center should read at least 165 degrees F (74 degrees C). Serve on the lettuce wraps. These can also be prepared ahead of time and frozen onto parchment paper. They wpuld then be easier to peel off and put directly on the grill. 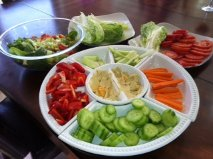 The rest of the meal included salad and a veggie tray with hummus. Birthday cake to follow on next post!